An independent consulting firm and industry source that we know quite well, Wohlers Associates, Inc., recently released the Wohlers Report 2015, the company’s annual detailed analysis of additive manufacturing (AM) and 3D printing worldwide. According to the Report, in 2014, interest in 3D printing reached an unprecedented level and exceeded the $4 billion milestone. The phenomenal attention to AM began in 2012, was sudden, and has continued to proliferate since then. Wohlers Associates is widely recognized as the leading consulting firm and foremost authority on additive manufacturing and 3D printing. This annual publication has served as the undisputed industry-leading report on the subject for two decades. Over the 20 years of its publication, many have referred to the report as the “bible” of additive manufacturing (AM) and 3D printing—terms that are used interchangeably by the company (and industry). The market for additive manufacturing, consisting of all AM products and services worldwide, grew at a compound annual growth rate (CAGR) of 35.2% to $4.1 billion in 2014, according to Wohlers Report 2015. The industry expanded by more than $1 billion in 2014, with 49 manufacturers producing and selling industrial-grade AM machines. The CAGR over the past three years (2012–2014) was 33.8%. An organization that we know quite well, Wohlers Associates, Inc., recently released the Wohlers Report 2014, the company’s annual detailed analysis of additive manufacturing (AM) and 3D printing worldwide. According to the Report, in 2014, interest in 3D printing reached an unprecedented level and exceeded the $3 billion milestone. The phenomenal attention to AM began in 2012, and it was sudden. As Greg Morris of GE Aviation said, “It was like someone flipped a switch.” Governments, major corporations, investors, and the mainstream media developed an insatiable appetite for additive manufacturing, and it occurred quickly. As it has from the beginning, Wohlers Report 2014 covers virtually every aspect of additive manufacturing, including its history, applications, underlying technologies, processes, manufacturers, and materials. It documents significant developments that have occurred in the past year, R&D and collaboration activities in government, academia, industry, and summarizes the worldwide state of the industry. This edition is the report’s 19th consecutive year of publication. 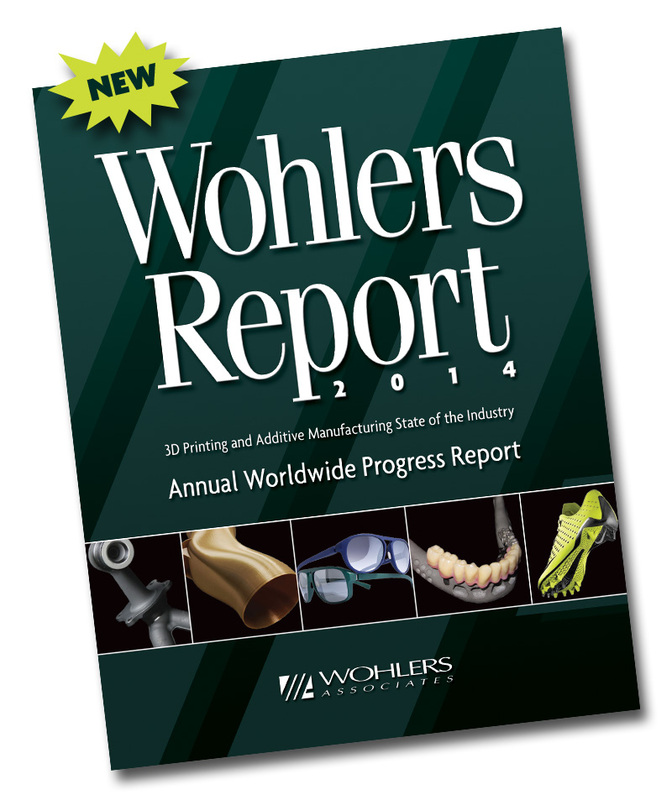 A company we have come to know quite well, Wohlers Associates, Inc., has announced the release of the Wohlers Report 2013, the company’s annual detailed analysis of additive manufacturing (AM) and 3D printing worldwide. Among many things, the report reveals troubling trends that suggest the U.S. may be losing its competitive advantage in the AM industry. To at least maintain a competitive advantage in manufacturing, the White House launched the National Additive Manufacturing Innovation Institute (NAMII) last year with the support of several agencies, including the Department of Defense. This initiative seeks to accelerate the position of the U.S. in the development and use of AM technology. “It will not be easy, given what organizations in China and other regions of the world have planned,” said Terry Wohlers, a principal author of the report and president of Wohlers Associates. As it has from the beginning, Wohlers Report 2013 covers virtually every aspect of additive manufacturing, including its history, applications, underlying technologies, processes, manufacturers, and materials. It documents significant developments that have occurred in the past year, covers R&D and collaboration activities in government, academia, industry, and summarizes the worldwide state of the industry. This edition is the report’s 18th consecutive year of publication. According to the new report, 38% of all industrial AM installations are in the U.S. Japan is second with 9.7%, followed by Germany with 9.4% and China with 8.7%. Sixteen companies in Europe, seven in China, five in the U.S., and two in Japan now manufacture and sell professional-grade, industrial additive manufacturing systems. “This is a dramatic change from a decade ago, when the mix was ten in the U.S., seven in Europe, seven in Japan, and three in China,” said Tim Caffrey, a principal author of the new report and associate consultant at Wohlers Associates. 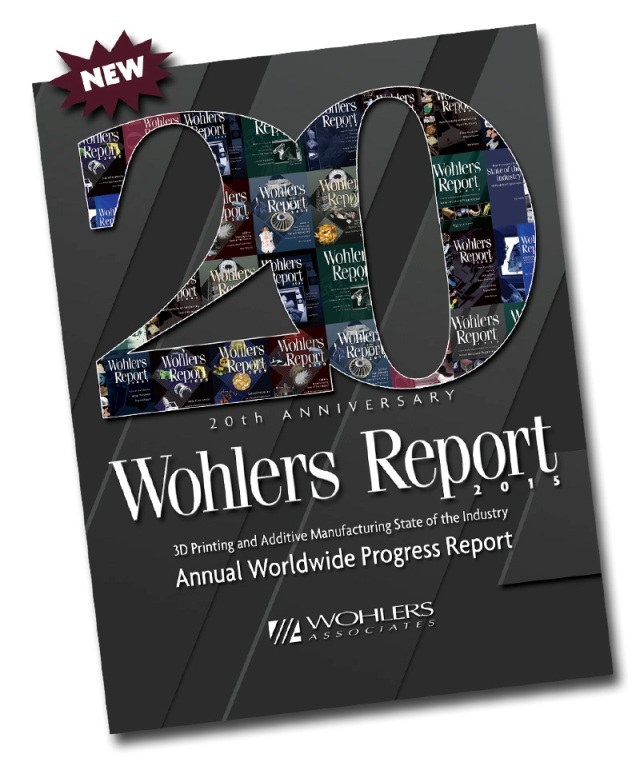 Wohlers Report 2013 provides an in-depth look at market forces and competitive pressures, as well as growth of the industry. Revenues from all additive manufacturing (AM) products and services worldwide were $2.204 billion in 2012. This is up 28.6% (CAGR) from 2011. Approximately 28.3% of the $2.204 billion is tied to the production of parts for final products, rather than models, prototypes, patterns, and other types of parts. The Wohlers Report is the most thorough and comprehensive report of its kind. It is packed with up-to-date and practical information that includes charts and graphs, tables, photographs, and illustrations. The annual study is priced at US$495, and was produced with support from 74 service providers, 31 system manufacturers, and the contributions of 69 co-authors from around the world. I’ve known Terry Wohlers for many years, and in my mind, he continues to the pulse checker and voice for the AM and 3D printing industries. I also highly recommend the Wohlers Report for its breadth, depth, and insights as the source of accurate and objective information about the ever-evolving world of AM.